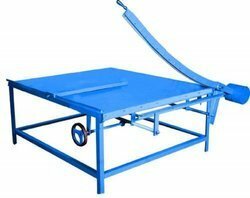 Board Cutting Machine Prominent & Leading Exporter from Chennai, we offer heavy duty board cutting machine, board cutting machine, manual board cutting machine, corrugation board cutter, carton board cutting machine and heavy duty corrugation board cutting machine. It is equipped with quality-assured blades, back and front gears. Our organization is engaged in manufacturing, supplying and exporting of remarkable Hand Operated Board Cutter. It is fabricated with ultra-grade raw material keeping in mind the exact specifications of the clients in order to achieve utmost client-satisfaction. We tested this machine the help of our diligent professionals on different quality parameters. They ensure it to be qualitative as per the international standards and flawlessness. It is equipped with quality-assured blades, back and front gears. 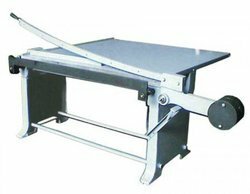 Suitable for cutting paper, corrugated liners &boards.The machine is fitted with front and back guides for measurement and the blade is perfectly balanced for smooth cutting.